Computes the intersection of two convex polygons. If the two polygons do not intersect, this node returns empty arrays in intersection x and intersection y with no error. X-coordinates of the vertices of the first polygon. You must specify at least three elements in this input. Y-coordinates of the vertices of the first polygon. You must specify the same number of elements in y 1 and x 1. X-coordinates of the vertices of the second polygon. You must specify at least three elements in this input. Y-coordinates of the vertices of the second polygon. You must specify the same number of elements in y 2 and x 2. X-coordinates of the vertices of the intersection polygon. Y-coordinates of the vertices of the intersection polygon. 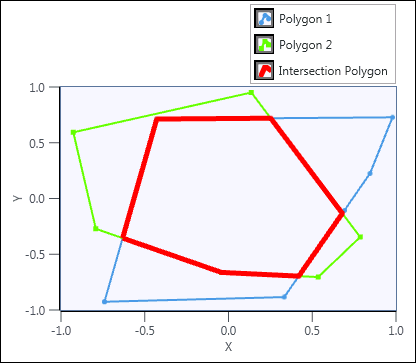 The intersection of two convex polygons is the area contained in both polygons, as shown in the following graph.